The Kalkhoff Agattu 3.B Move is a simple, yet alluring inexpensive touring e-bike from Kalkhoff, powered by Bosch. Instantly recognisable as a Kalkhoff, the Agattu 3.B Move is built to extremely high standards in Germany. Its beautiful curves and smooth lines complement a very eager performer. Internally routed cabling, sensible ergonomics and a real attention to detail make this Kalkhoff quite special. Bosch’s Active Plus motor is ultra smooth, quiet and provides ample power. Furthermore, a large 500Wh battery provides great range. More than sufficient for those lazy days out. Designed for long and relaxing days out in the countryside, the Agattu 3.B Move is equally at home on canal tow paths, railway cuttings or as a regular commuter. 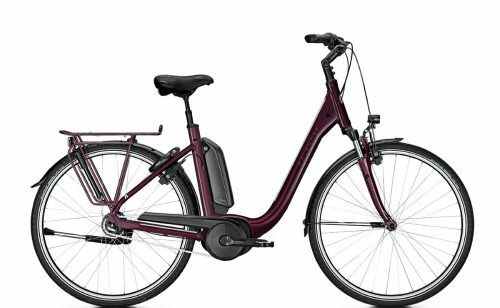 The suspension seat post, upright riding position and practical nature of this bike ensure a superb level of comfort at all times. Adjustable front suspension allows easy fine tuning to suit the terrain. Hard or soft, the ride is extremely comfortable. Gearing is hassle free, thanks to a smooth Nexus 7-speed hub. Quiet, efficient and very clean. Shifting is a breeze via a simple twist shifter on the bars. As a result, changes are seamless throughout the range, whether climbing or descending. The Agattu 3.B Move is all about ease of use and practicality. Simplicity and effectiveness. Braking is reliable and responsive thanks to the Magura HS11 hydraulics on the rims. The Agattu comes with bright and effective lighting both front and rear. The AXA LCD lamp provides more than enough to be clearly seen. A rear carrier, mudguards, and stand equip the Agattu for all journeys. A pump is on hand, and fits neatly on the rear carrier, unobtrusively. The Agattu 3.B Move is all about ultra comfort and quality build at a very affordable price. Available in THREE colours.